I’m getting this whole THEY STOLEZ MY IDEAZ!!! rant in before it’s too late, just so that when I post on the 11th I won’t have to open with it. I probably will, mind you, but this way I have a choice. You can find the bloggy advent calendar here, and in the sidebar, probably until next July because it’ll take me that long to remember to remove the widget. In case you’ve never had an advent calendar before, click on each day to reveal adventy bloggy community goodness. And chocolate. Oh wait, no, that’s only if you get a REAL advent calendar. Silly readers. I was going to include the daily links for the supremely click-lazy but I changed my mind, because like Mr. Burns I am unpredictable and fickle. And also because Syl deserves much click-love for the idea. 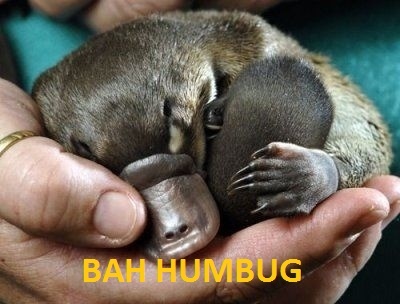 And now for something completely different: a baby platypus. Happy holidays!